In: Himalayan Research Bulletin 17,2:11-16 (1997). It was an evening in spring when one of our neighbours came along and asked my parents if I could work in his household for one year. He wanted to pay 100 Rupees. This was a lot in the early sixties, when 20-40 Rupees were quite normal for such kind of one year job. In addition I was to get a new dress once a year as it was tradition. My family was not in a good economic position, and in spring, when the new harvest was still far, we usually did not have enough to eat. We already had the problem of not being able to repay all the money we had borrowed from other people. So my parents could not buy a new dress for each of us every year. This was the reason why our neighbour did not have to ask for long. My parents accepted his offer at once. Finally the term of employment was laid down for two years. My own opinion was not asked for, but my parents knew that we children usually did everything they asked for without protest. My elder brother had already worked for our neighbour for one year, but he never talked to me about that time. The next day I went to the house of our neighbours whom we used to call uncle and aunt. They had two daughters and one son of their own. During the first weeks the neighbour's pretty wife was rather friendly. She had been born in Pharak, the steep gorge between Khumbu and Shorong (nep. Solu). One of her brothers had already been married to her husband's sister before she married her husband. The latter had been married before to a woman from Zhung. When he once had gone to Zhung to work for his parents-in-law he had sent his first wife to one of her uncles in Phaphlu, who married her to another man. When our neighbour later married his second wife, they got a great dowry, for example 15 calves, many clothes and a lot of jewellery. Immediately after my arrival at the neighbours' house I had to go with them to the alpine pastures at the Womi Tso. There I had to do all kinds of work for the family, from the first light of dawn till late into the night. During the first days I could sleep together with my employers in their hut, but later I had to sleep outside on the bare ground under the trees. All the neighbours' children were dressed like boys. The elder daughter had the same vicious tongue as her father. All day long she swore on the lhangang of Takshindu and Tengbuche. I had to do every kind of work my employers asked for: fetching water, collecting firewood, cutting grass, bringing fodder for the cattle, gathering stinging nettles, washing the dishes, grinding flour, etc. The dog and me were always the last to get some food. Whenever we moved to another place I had to carry all the pots and dishes in a big basket on by back uphill and downhill. All these things were so heavy that my legs trembled. The basket's strap pressed so much against my head that I thought the latter was going to burst. To crown it all I besides had to look after my employers' young sun, who was very lazy in walking. He always had got very good food from his mother. So he was rather heavy. Once my employers bought a bull, whose only task was to cover the family's twenty zom. But the bull did not seem to be taken by his many wives and so it ran away at the first opportunity. Of course it was my task to look for it. It was a very foggy day, and I did not find a single trace of the bull in the dense pine forest. Finally my employer found it at the place of its former owner, whose cattle were grazing nearby. In the evening my employer shouted me I would not have taken enough care for the cattle, but his wife stood up for me. It was the first time that I was really dispaired, and I asked myself, why I had to bear this fate. Was it only, because there existed a paper I could not read? There were already a lot of herdsmen at Womi Tso when we arrived. Among them was a woman who had worked as a maid for more than twenty years. She told me it was not easy to work for other people. This was the year she wanted to consider it finished and to go to Darjeeling. She slept on a rock huddled together under her kung (an umbrella made of limebark or big leaves). The weather was so misty that one could not see very far. Besides the temperature was perishing. The sun seldom put in an appearance. But the acoustic spectacle was the more impressive. We always heard avalanches thundering down and the sounds of the numerous animals. At Womi Tso I also met my cousin Sumi, who worked as a maid for another family, too. Like me she had to sleep near the cattle on the wayside in the mud, while her employers slept close to the fireside inside their hut. Her situation was even worse than mine. Her mother had died, and her father didn't have a house of his own. So he went to Rai villages to look for casual works. My cousin's employers had only one child, a very spoilt daughter. She was the only girl in her village being sent to school. Some men had already asked for her hand in marriage. Among them was one kapa (painter; lit. : a man of genius) Danu from Chiwang. But she finally was to marry an arrogant man from Chunagpo, who got signed over her family's whole land on the day of marriage. On this occasion he was told that the girl now was his possession, from her hair down to the nails of her feet. Of course there was vice versa no talk of the man being in the possession of the girl. Nevertheless the marriage broke up very soon. The man went to India where he worked as a taxi driver, while she hung around with other men. Sumi's employers also had a son, but he had been recognized as a rimpoche (high reincarnation) during his childhood. 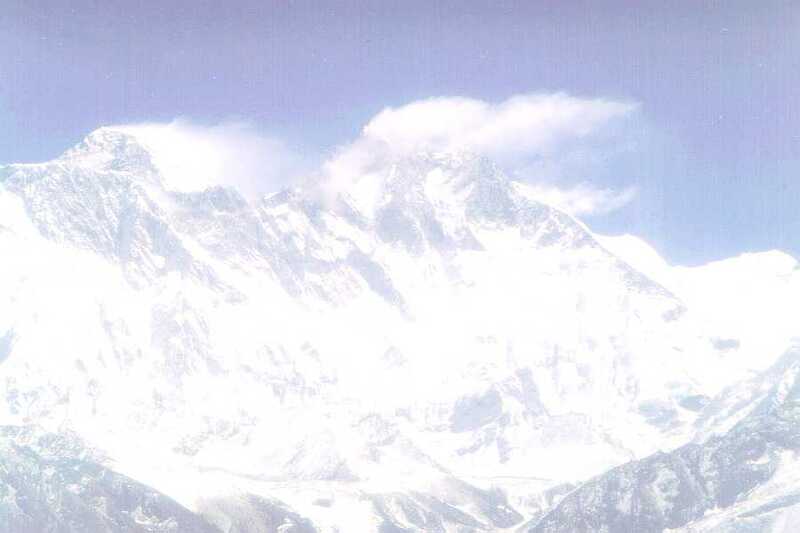 He had crossed the Nangpa La (the 5716 m high pass from Khumbu to Tibet). Once he had sent a letter to his sister asking for a special kind of medicine made of roots, which were only found on the pastures near the Womi Tso. The family decided to go to Tibet together. Before their departure they celebrated happily for one week, but then they did not go at all. Later it was told that the young man had landed up in the Chinese ear-sacks. One day at the Womi Tso I got help from a Tamang, who always trembled. So we only called him "the trembler". It was told that he was affected by this illness because he once had killed a cat. Sometimes he even did not remember where he was going. When we once went to the west, he went to the east towards Pharak. We laughed when other people told us that they had met him on their way. But in the evening he finally arrived, too. The Womi Tso is a traditional place of pilgrimage for Hindus and Buddhists as well. So at night there usually came a lot of pilgrims who asked to stay overnight. There soon were so many people in the small hut that they could not lay down, but everybody had to sleep sitting. Among these guests there once was a cheerful young girl. She was in the company of a elder man who had to look after her. Our trembling Tamang had obviously got some feeling for this girl. He jumped all around the hut and shouted that he wanted "nani banaune" (nep. : to make a baby) with the girl. To bring him back to reality I attacked him with a burning piece of firewood. But our Tamang was not the only one to be shocked. I heard my employer asking "Girl, what are you doing?" One day one of our cows was caving. For days she tried to make the calf stand up, but it was too weak. My employers did not give it any food or milk, because it was a male calf, and so it was useless for milk production. So the people waited until it died. This happened on the seventh day. Its tail was cut and put in front of the cow's head, so that she could smell and lick it, whenever she was milked. Later I have thrown the tail away. Then the cow licked my head. It seemed that I now had become her child. I felt it was a cheat how the women and girls on the alpine pastures abused the trust of the cows. Every year they were responsible for the death of so many calves. It was told that this was the reason that so many women in the hour of their death cried like dying calves. Some time later we moved to another hut, which lay in direction to Pike (a 4070 m high mountain in Shorong). One night my employer's wife woke me up, because she had heard some suspicious noises. She asked me to bark like a dog. I did so and scratched with the soup ladle on the stones of the fireplace. Then we heard a loud noise outside. Stones were tumbling down the slope. It seemed that indeed a person or animal had been outside our hut. Maybe it was one of the sheep of the Gurung, that were grazing in great number in this area. Some days earlier I had already found a dead sheep lying between some rocks. Since nobody came looking after this animal we took it into our hut, carved it up and ate it. We saw no reason to let the vultures have it. My employers wife told me that her mother-in-law once on a pastoral feast had got involved in an argument with a man from Pikyongma. Some days later eight men had come and asked for her father-in-law. His wife had been afraid, that these men wanted to beat him up. So she quickly had helped him to flee through the back wall of their bamboo hut. The men had been very angry and took their whole butter store. This event was the reason, why my employer's wife was always anxious, when she heard a noise at night. Sometimes I became very homesick for my mother and for my village. The steady fog further intensified my depression. Often we did not see the sun for days. Down in our village it had been much lighter. So I asked my employer, who often went down to the village to transport goods there, if I could once accompany him. But he fundamentally rejected this request. One day I had some interesting discussions with a neighbours' child. We did not see that one of my employers' animals started quarrelling with one of the neighbours' yaks. They were already fighting with their horns. Soon it was too late to interfere. Suddenly our yak rolled headfirst down the slope. It overturned twice, and I was indeed relieved when it stood up again. After some time our pasture was grazed, and so we had to move again, this time in eastern direction. On our way we stayed the night in a cave. It was already dark, when we arrived there, We were missing one of our cows. The next day we found her with a broken leg. We could not do anything for her, even though she was still alive and mooing. So we abandoned her to her fate and moved on. Some time later we heard a small dog barking. Slowly we went closer. Only a few steps away we made some noise. It seemed we had surprised an unmarried couple doing their loveplay. Obviously scared a half-naked young man jumped up and ran away. The young girl waited and exchanged some words before she went away. Later we heard that she had got a stillborn baby. After some days I had to go back to look after the cow with the broken leg. On my way I met a men, who gave me two roasted corn cobs. The people knew that maids usually did not get enough food from their employers. That was why they sometimes gave me something to eat. The man wanted to know where I was going, but I was not allowed to talk about it. So I only told him in which direction I was going. When I finally approached the place where we had left the cow, I heard a big noise. The cow had already died and a great number of vultures had descended upon the carcass. I was afraid of the scolding big birds and ran back as fast as I could. After some time I met a man with a big basket on his back, but I pretended I had not seen him. I was afraid he could be the young man we had scared a few days ago. With the sun already setting I ran through a forest where hundreds of crickets were chirping. Now I remembered that one of my cousins had been raped by to men, when she had been only seven or eight years old. Reminding this I ran even faster. It was already pitch-dark when I arrived at our hut. My bare feet were bleeding despite the thick horn skin of my soles. The next day my employer went with a pack animal to fetch the meat the vultures had left. Later I had to cut it into small strips, which I smoked above the fire. Of course, I myself did not get a single piece of the meat to eat. They must have eaten it when I was out of the hut. I only got hot curd cheese. Once I got an old dress my employer's wife did not longer want to wear. I had to decide if I wanted the old dress now or a new one later in mangsir (November/December). Since I always felt cold I chose the old one. In September the weather was getting better. The sky became clear and we could look down upon the valleys and villages. I heard that my parents had given their hay to other people, so that the neighbours' animals could graze on my parents' land for some days. The reason was that they needed some fertilizer for their fields. Once I met my little brother Dawa who was working for other people for some days. I had not seen him for half a year, and so I was very happy. I wanted to invite him into our hut, but I was not allowed. So we talked and laughed for some time. It seemed he had grown and become self-confident. One of my tasks was to look after the cattle that they did not drink out of hot springs. People believed that else they would loose their calves or become ill themselves. Then the animals foamed at the mouth, and it was told that they had got tseta (malaria). Once I went to a corn field belonging to Rai, where I was to pluck some stinging nettles. There I met two Rai boys who were guarding the field to prevent monkeys, bears and other wild animals from plundering the corn. I went to their tiny hut and asked them for a corn cob. But they refused, fooled around and ate their many cobs before my eyes. I did not understand why they refused to give one of their corn cobs. I could also have stolen one, but I didn't. So I went away with my stinging nettles. After some time it was told that one neighbour, who had always been very kindly, had beaten his wife. The woman had run away, but returned home in the evening. These neighbours had a dispute with my employers over the boundary of their respective pastures. Before my eyes my employer's wife started an argument with the neighbour, pestered and pushed him. Later she falsely claimed the neighbour had torn off her necklace. She wanted to force me to attest this, but I refused. Later I was happy that the dispute could be settled without my attest. After monsoon all people were only thinking about their hay harvest. There used to be a great shortage in labour force. Often people from Ringmo and some other villages or poor families came to help in exchange for some buttermilk or grain. There was a lot of talk during these days and lots of rumours were spread. Once we heard that a young woman had been made pregnant by her brother-in-law during the hay harvest. Another time it was told that a young girl had got her first period. The fifteenth day of mangsir was the date, when all Salaka Sherpa were allowed to drive their cattle on the harvested pastures. This was the time when all people met together again, those who had gone to the high elevation pastures as well as those who had stayed down in the villages. But it was also the month when all interests had to be paid, usually in the form of grain. And finally it was the month when most marriages took place or new relations were arranged. But it must also be mentioned that it was the month when many children or servants ran away. They mostly went to Darjeeling. In that very special year my cousin Maya moved to her husband for good. Her adoptive parents had shared their harvest with them so that the young couple could celebrate the event appropriately. The young man had worked for his parents-in-law for some time. But Maya did not get any land, even though her parents had a lot. All their land was for her brothers. She only got some jewellery, dresses, a few pots and two cows. It was during this festivity that I met my mother and my two little sisters for the first time in eight months. Late at night I went home together with them. I had long discussions with my mother until the early morning light. I told her that I did not like working for those people and that I would not hold on for another year. I would run away as soon as the first year was over. Of course my parents would have to pay the money back, but this was already spent. My parents had bought a pregnant cow, but unfortunately the cow had later died, and the male calf she had born was sold for a few Rupees. Surprisingly I had my mother's fullest sympathy. She told me, if the time had come I should go to a family in Ringmo who had been our friends for a very long time. She wanted to inform them that I was to arrive in the near future. Early in the morning I went back to my employers, where I lay down to sleep in the hay. During those days I had to carry a lot of manure. It was a very exhausting task. At night I often had to stand up and look after the cattle. Sometimes I pretended not to hear when my name was called in the middle of the night. When I was woken up at dawn I first had to go out to cut grass for the cattle. Then I used to go to the other side of the small river, where I cowered under a big tree until the sun came up. From there I could hear the noise coming out of the hut. I heard the corn popping and the children chatting. I was cold and I was afraid of the wild animals. So early in the morning one should not run through the woods. One evening my employer's father-in-law came along with a little son and a heavily packed horse. They wanted me as a porter to Pharak. I was ordered to carry two thing (i. e. about 60 kg), a weight only the strongest men used to carry. As this proved to be too heavy for me my employer sent me to a neighbouring hut where my cousin Sumi was working. I had to tell her that her elder sister Kinzi had come from Pharak, even though not a single word of that was true. They only wanted Sumi to come to their house. Of course, she did, but as soon as she arrived she saw that her sister was not there. Nevertheless she agreed to carry the load to Pharak together with me. Later when her father came to her employers to claim the wage for his daughter's work, which he used to spend on drinks, he was told that he would not get any money since Lhakpa had taken his daughter away. He then must have been very angry and shouted all around. So we went off to Pharak. The old man used to pray his "Om mani padme hum" all way long, and the little boy sang wonderful songs that were echoed from the mountain slopes. The horse was gasping, because our way was not suited for horses, but the old man showed no fear. Our way seemed very short since my cousin had to tell me so many things. We talked about years of bad harvest and hunger (nep. and sh. : anikal), but she said her employers had always enough to eat. After crossing the Womi Tsangpo we came to a Rai village, where we stayed in the house of a man who was the mit (friend) of the old man's eldest son. This Rai had two wives. The elder one had not got any children, and the younger one was almost blind. This Rai family was later robbed. They had harvested a lot of corn which was sold for a good price. They stored the money in a basket in the attic of their house, since there were no banks at that time. It was told they had had a basket full of money. But one night thieves came ant took the whole money away. It was a well planned burglary. Two very poor Tamangs were accused, but they only seemed to have been henchmen of some Sherpas. In the old man's village there were only four houses. His own house was by far the biggest. As soon as we arrived his wife told him that a calf was missing. The old man shouted her and their children until she told him that she had been worrying, because he had stayed away for so long. Then he calmed down. They both had been widowed before they married each other. While I was delousing her she told me that she wanted to go to my village to look for daughters-in-law. I did not say anything, since I thought she was talking about me. My mother had always been against such a connection. She had said that these people may have a two-storeyed house, but this one cannot eat. It seemed that not much of their former wealth had remained. I stayed with this family for one week. It was a rather comfortable time for me. During the day I had to tend the cattle together with the people's sixteen-year-old daughter. The girl told me that my cousin Kinzi was badly treated by her sister-in-law, who she was working for. For example when she was late with the fodder her employer used to shout: "Are you looking for your mother's or your father's stiff or for your own one's?" The Sherpas used to take such words as an insult. The old man's wife once invited me into her house for dinner. Me and my two cousins got some corn soup with buttermilk. Later we had talks for many hours. Kinzi who was much older than me had been eleven or twelve years old when she had been sent as a laom (maid or servant for other people, but also used as a swearword) to another family. The people always told that she liked her job so much that she stayed for many years. But actually she was fed up to the back teeth with it. Many times she would have liked to run away, but she did not know where to go. Also in her case the father came to fetch her pay, which he used for his drinks or for the repay of his debts. But he always told his daughters that he needed the money to have a bridge been built for their mother who had died many years ago. My cousins wanted their mother being saved from nyala (hell), and Sherpas believe that building a bridge can help. So they worked for many years to bear the costs. But now Kinzi wanted to consider it finished. The next pay she wanted to keep for herself to buy some earrings. Many years ago before she came to her current employers she had been working for two other families, but she had run away twice. I remembered the time when I was a little girl. Then me and Kinzi once had to bring bangma (mush, that is left over after distilling arak, spirits, and then used as fodder for the cattle) from Yawa to the pastures high above Panma. On our way we deliberated how to reduce our burden. We decided to pour out the liquid and also threw away a bit of the mush. We covered it with leaves so that grandmother could not se it when she came along. Later in spring Kinzi had told me that it would be nice if there were berries all over the year. Then we would not have to work for all our life. But there were berries for only two months in the year. Kinzi had also told me that there would be no life on earth if the sun and the fire did not exist. Such remarks had made deep impressions on me. I don't know why my cousin had such philosophical thoughts. Kinzi also told me some tales about witches owning guest houses into which men were invited. When the men were sleeping the witches abducted them and ate them up. Another witch could change into a precious young girl. When a young man came to take her as his bride she sat behind him on his horse. On the way back home the young man recognized that his young bride had turned into an ugly old witch. The enraged man drew his knife, but the witch changed into an old boot which tumbled down from the horse's back. Once in my childhood I had helped Kinzi's mother to harvest the hay. Then Kinzi came along and talked to us for a while. At that time she had already been working for other people and my aunt told her to be hard-working. I was surprised, because my mother would never have said that. In fright I swallowed the dumpling I was just eating the wrong way. I still hear my aunt's nasty remarks: "Don't eat and talk at the same time, else you may die." Later Kinzi supported by her father had run way from her first employer. Both of them had come to us looking for shelter, after they had stayed in a Rai village for one week. Unfortunately there had been a traitor in my family who betrayed them for a lice-ridden blanket. Then my cousin's father had sent her to work for another family. But soon she had run away again. She had come to us and her employer had called from outside the house if she was there. My mother had denied this and we had hidden her in the hay. Later her father had come and made objections that we had persuaded her to run away. My father would have no right to decide about her. He would be her father, and if he should die, it would be his brother's task to decide about Kinzi. It would only be after his brother's death that my father would have to decide. Then my uncle had taken Kinzi away and had brought her to her current employers in Pharak. My grandmother once told me that her husband had given Kinzi's mother away for a litre of chang. It had been grandfather's motto that people grown up under hard conditions would always be able to work hard. In his opinion Kinzi's father who had been an orphan since his early childhood was such a person. In the beginning grandfather had even promised to give some land to the young couple, but later he did not keep to it. It had been told that my aunt became ill the very day she had been given away. They settled in Akang, and one day I was sent there to ask my aunt to come to Yawa and help my parents to till the fields. But she had already been too ill for work. She gave her one-year-old daughter Sena to a Rai-mit, because she felt that she was going to die. Then my parents went to Akang with some good food to help her to recover. Later grandfather and his sons carried her to Yawa, where she died after some days. Her body was cremated without any pomp. I had heard the music of the funeral procession, but I could not go there because I had to tend the cattle. Later my grandparents had the monks of Takshindu pray for their daughter. After some time my father visited the Rai family who had taken Sena. But she did not recognize him and asked her foster parents who that stranger was. She behaved like a Rai and did not speak a single word in the Sherpa language. The Rai language had already become her mother tongue. Some years later her sister Sumi went there and wanted to take her little sister with her, but she did not want to go with the strange girl. The Rai family really treated her well. But later when Sena had grown up they explained to her that Sumi was her sister, and then she went away with her. About all these things we talked together there in Pharak. It was late at night when we finally laid down on the floor to sleep. The came the day I had to return to my employer. That was very hard for me, because I had enjoyed those days in Pharak. A friend of my parents who lived in that village gave me some potatoes for the way. Then I went back to Shiteling. In one of the villages en route I cooked and ate my potatoes. In another village I met a woman who was selling chang on the wayside. I told her that I didn't have a single paisa, but she only laughed, gave me two jars of chang and said, for that I could become her daughter-in-law later. At night I slept in a cavern together with seven or eight other girls I had met there. Since I didn't really want to go back to my employers I walked very slowly the next day. So I only came up to the Rai village of Yapil. There I slept in the house of my father's mit. When I arrived at the place were I had left my employers' family about two weeks ago, they had already gone to another place. The hut as well as the cattle had disappeared. A neighbour told me that they had gone to a cave above Akang. When I arrived there I only got some burnt popcorn. Some days later we moved again, this time to a place high above Akang. From there I had to go with my employer to Shiteling to weet the corn field. It was already late at night when we returned to our hut. On our way my employer asked me to go faster; else the zig (leopard) would come and eat me. Then he ran ahead and hided behind a tree. When I came near he imitated the sound of a zig. I cried out and called for my uncle, as I used to address my employer since he was my father's cousin, but I got no answer. Later at the hut he made fun of me in front of his family, because I had been so afraid. This incident hurt me a lot. It was since that time that I did not like the family any longer. Once my employer's younger brother came along with his little dog. We sat around the fire while the dog was barking outside. Then my employer's sister called from outside that a zig was stealing around the cattle. My employer took a burning piece of wood and making a lot of noise he ran to his sister's hut, which was near by. After throwing some stones he returned to our hut. We sat some time around the fire and ate our soup. Suddenly we heard the dog whimpering; then everything was silent outside. The uncle jumped up again, but when he came out the dog had disappeared. The zig had taken his food. After some time I was ordered to bring a hoe to the house of my employer's parents in Yawa. This I did, but then I decided not to return to my employer's hut. First I did as if I was returning. After meeting some other people who later attested that they had met me, I went to my uncle in Shiteling. I told him that I wanted to run away. He gave no comment. The next day I went to Phuleli and then up to the old nunnery of Takshindu of which today only a few ruins are left. There I met four women of a related family. The eldest one was a nun and the others were also unmarried. They gave me something to eat. Later two Sherpas came along with a white man. He was the first European or American I ever had seen. One of the Sherpas had to cook while the other had always to run behind the white. The latter had said that the place near the hut was too dirty and so he went in direction to Takshindu La. Of course, it was not dirty at all. The cattle had only made the ground sodden knee-deep. It seemed the white man could not distinguish mud and dirt. So we laughed about him when he sat down with a grim expression and picked on his typewriter. Addendum: This original text has been edited before publication by Himalyan Research Bulletin.